Whatever happened to Yellow Hook, Brooklyn? Back when the Dutch settled this part of the town of New Utrecht in the 17th century, they named it Yellow Hook—after its yellowish soil. The problem with Yellow Hook, however, was that it sounded too close to Yellow Fever, outbreaks of which were regularly killing New Yorkers. 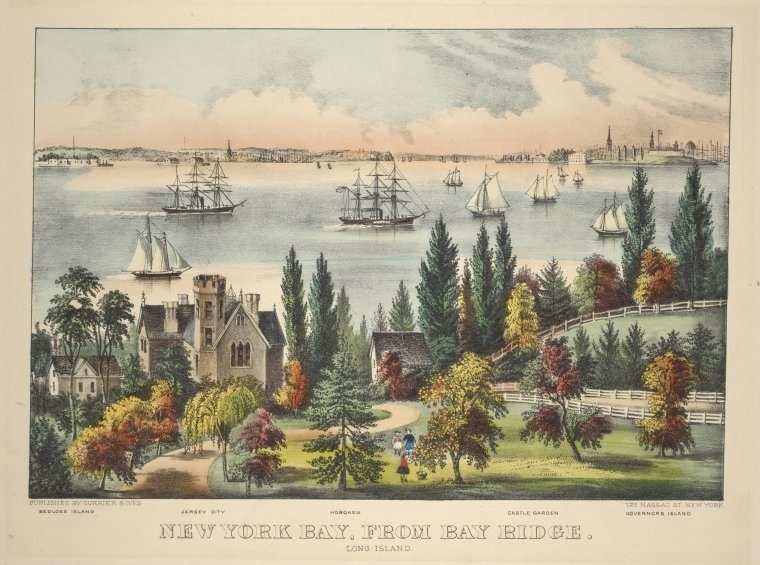 So in 1853, locals gave Yellow Hook a more pleasant moniker: Bay Ridge, for the ridge that offers such amazing views of New York Bay. Two innocent typos, or perhaps the neighborhood’s real name? This entry was posted on July 16, 2010 at 3:59 am and is filed under Brooklyn, Disasters and crimes, Politics. You can follow any responses to this entry through the RSS 2.0 feed. You can leave a response, or trackback from your own site. There’s a Yellow Hook Grille in Bay Ridge, giving homage to the old name. I believe that an alternative name which was used prior to settling on BAY RIDGE was GOLDEN HORN, a play on YELLOW (GOLDEN) and HOOK (HORN), as there was an Apfel’s GOLDEN HORN BREWING COMPANY located at 3rd Ave between 96th & 97th St.